Every time parsnips are in my fridge I just can’t seem to escape the routine of slicing them up, tossing them with a little olive oil and salt and popping them into a super hot oven. It’s too easy, too delicious, and will make your house smell like a home. And although I would highly recommend pairing parsnips with some type of protein (due to their high GI index) I would be lying to say that more often than not, I eat them like finger food as a late afternoon snack or pre-dinner nibbles.They are just so hard to resist straight out of the oven, sprinkled with some kosher salt – go ahead and make them and you’ll see exactly what I mean;). But, if you can restrain from eating them before they hit the table, they would make a great addition to your Thanksgiving menu this year (I’m actually planning to serve them in place of mashed potatoes). What kind of sides are you planning to serve with your turkey this year? Will parsnips be on your menu? 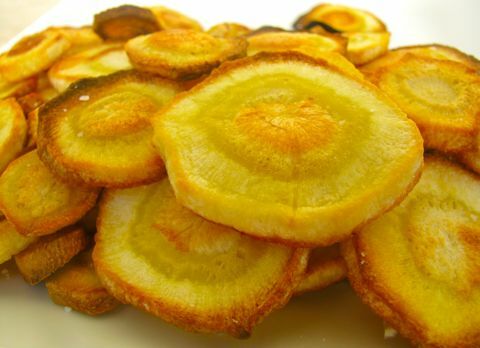 Slice the parsnips into thin coins. Toss parsnips in the olive oil and sprinkle with salt. 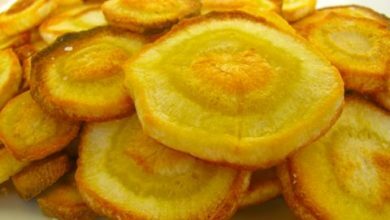 Lay parsnips out on a rimmed baking sheet (making sure that they do not overlap). Pop in the oven for twenty minutes. Remove, flip the parsnips and put back in the oven for another 15 minutes or until they are golden brown. Sprinkle with a little more salt and enjoy!